Pet**: $15 (per pet. Pet membership includes a free bandana. Business: Starts at $250. "Natural Partners" have access to additional benefits. For additional information please call 830.249.4616 or email Sara Brumby. Become a CNC&F Member Now! ...and you can make your gift last all year long! 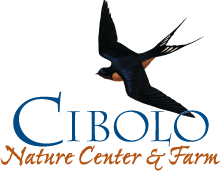 Consider a monthly or quarterly gift to the Cibolo Nature Center & Farm. Your recurring gift can be paid by personal check or can be automatically linked to your credit card. Just tell us how much and how often you’d like to donate.